A great deal of information exists as to how to improve relationships. Unfortunately, insight and understanding do not necessarily translate into change. Rekindling The Flame, however, focuses on unconscious patterns of intimate communication that results in spontaneous improvement on all levels of your relationship, from everyday communication to sexual passion. So how do you raise the temperature of your love life? 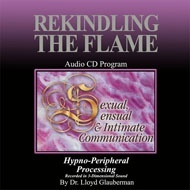 Rekindling The Flame utilizes Dr. Lloyd Glauberman�s revolutionary HPP method to program your unconscious mind to make relationship changes. This method �short circuits� any frustrations or disconnects between lovers and installs more appropriate rhythms of two people communicating harmoniously. You will find yourself less anxious, communicating more easily and becoming more sensual and sexual. You might even rediscover the excitement of when you first met! And it will all seem natural. This program works best if both parties are using the program. However, individual use will also result in relationship breakthroughs and rising temperatures! We all want to spice up our love life and feel the heat of passion burn. Remove any unconscious barriers and have the relationship of your life with Rekindling the Flame.